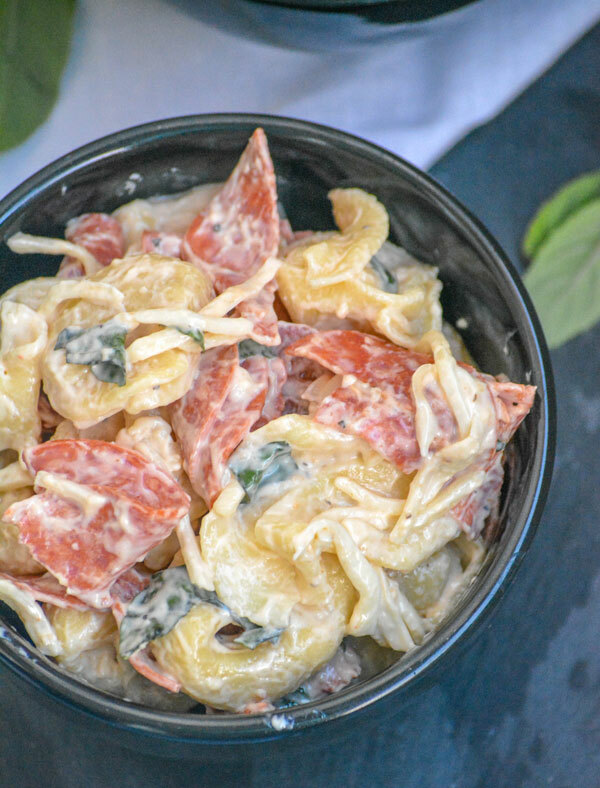 Usually, I’d argue that this Pepperoni & Basil Tortellini Salad dish makes a perfect salad for Summer, whether it’s as a side dish or a meal itself. And it does. But when it’s unseasonably warm weather-wise on the home front and were less than two weeks away from Christmas, I’m not going to rant or rave. I mean I can’t actually do anything about it, so why not just go with it? 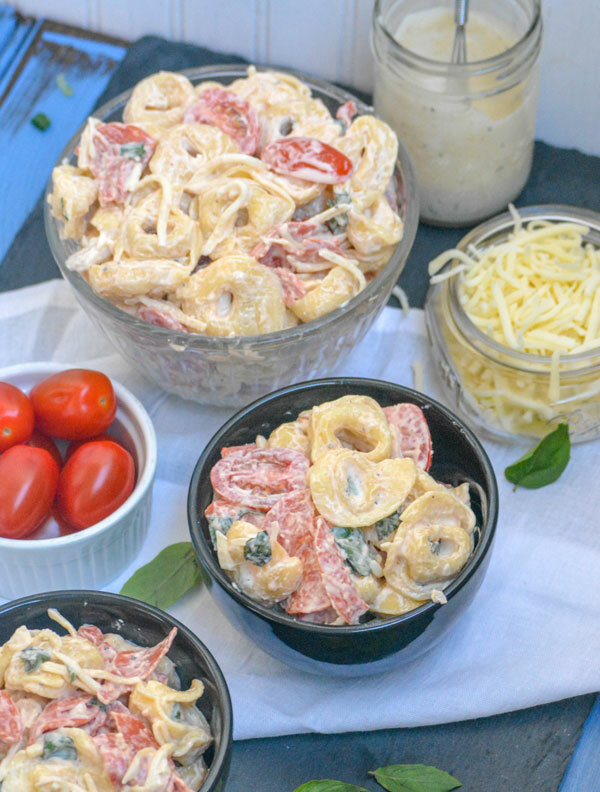 Just picture it, your favorite cheese tortellini with ripe grape tomatoes ready to burst with flavor, fresh basil, a generous helping of chopped pepperoni, and all mixed up with your favorite creamy Caesar salad dressing. 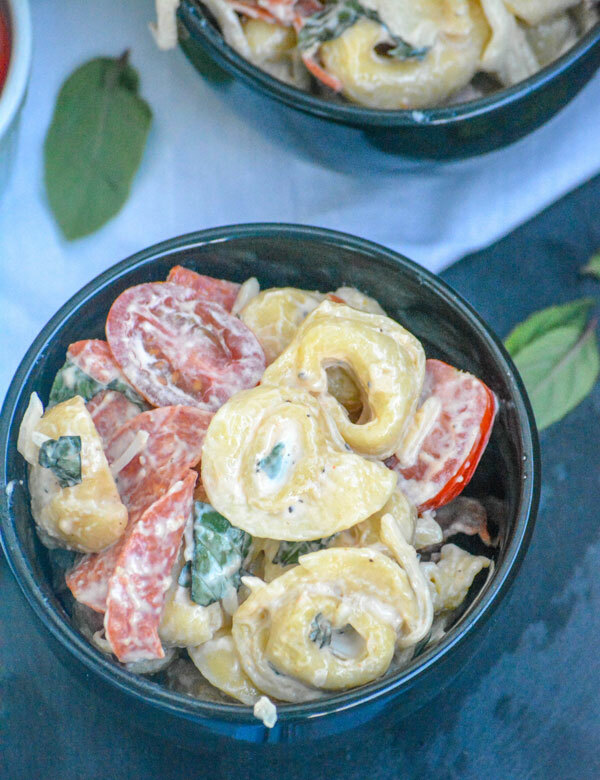 It’s definitely not for the faint of heart, or anybody on a diet, but if neither of those apply to you, our Pepperoni & Basil Tortellini Salad is a truly dreamy combination. Trust me, you want in on this dish. In a month filled with warm, rich comfort foods and chaos. If you’re a parent with kids home on break, deperately needing more lunch options than the typical brown bag variety, run headlong toward this ‘salad’. 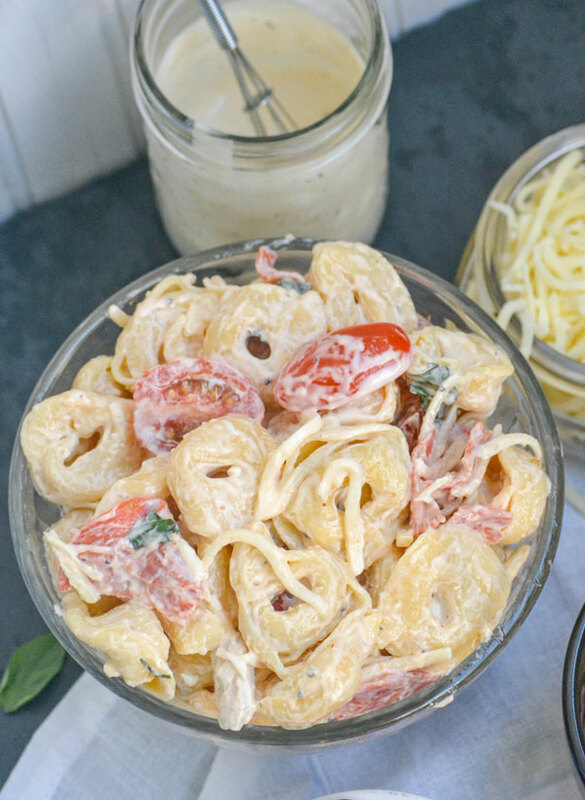 This is pasta salad, 2.0, and it’s just the change of pace we enjoy. With the roller coaster weather, us and our meals have to roll with the punches. 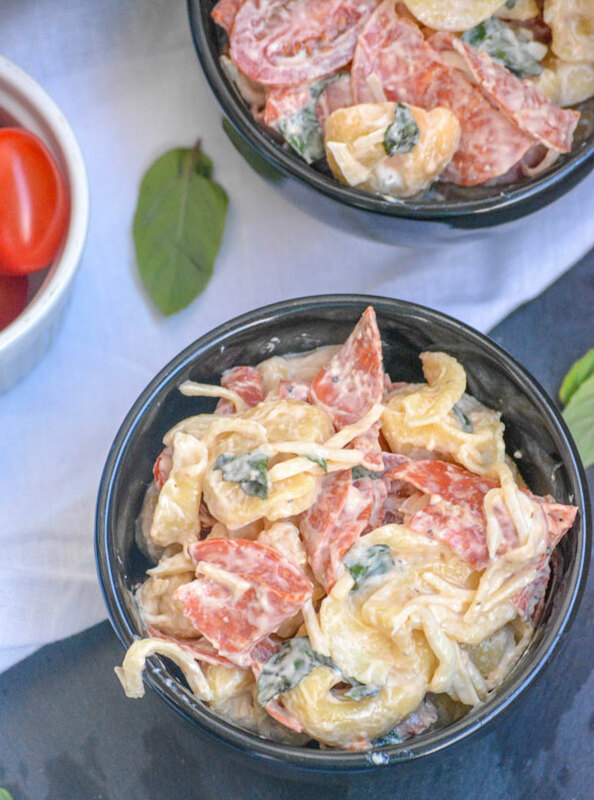 I’ll repeat- a quick & easy meal, featuring cheese tortellini, a kick from some chopped pepperoni, sliced sweet grape tomatoes, and some fresh basil- this Pepperoni & Basil Tortellini Salad is an edible experience everyone needs to have. 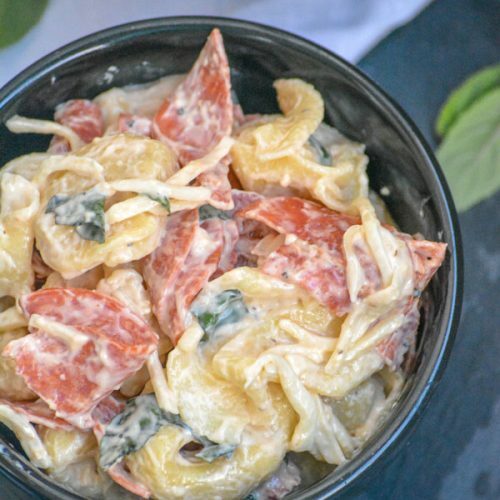 A quick & easy, fresh take on a pasta salad this one features creamy Caesar dressing, chopped pepperoni, grape tomatoes, and fresh basil for a delicious spin on a typical Summer side. Cook the tortellini according to package directions. Drain and transfer the tortellini to a large bowl. 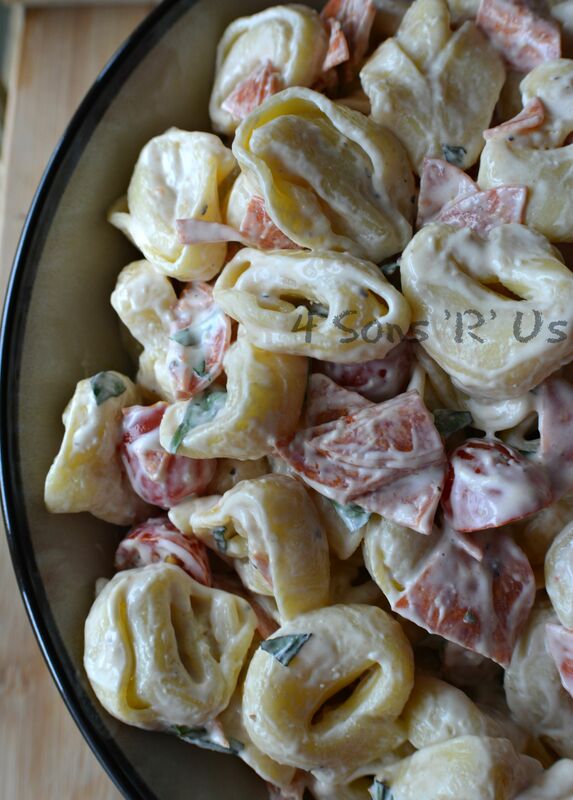 Stir together the dressing and the cooked tortellini. 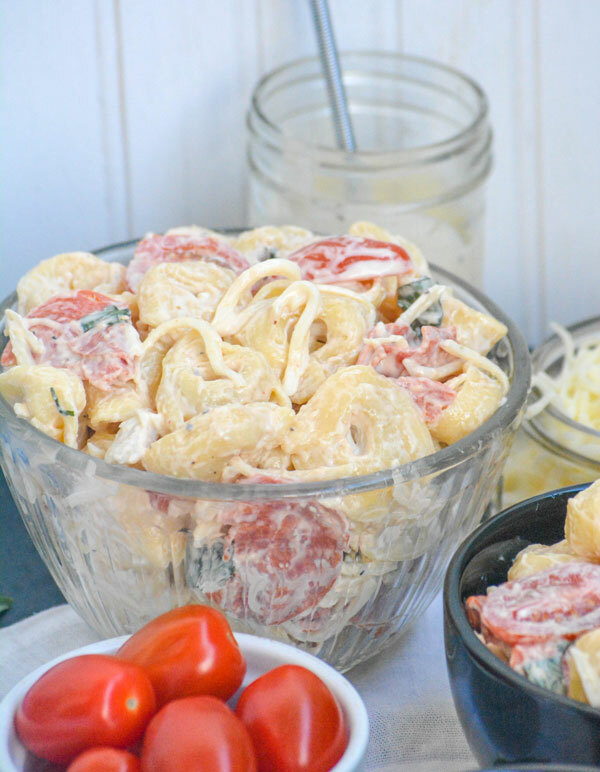 Add in the pepperoni, basil, cheese, and tomatoes and gently stir together, so that the tortellini don't fall apart, until everything's evenly combined. I definitely do want in on this dish! Oh my goodness, all these lovely flavors coming together and making a party for my mouth! Sounds delicious for ANY time of year!